Join some of the most well-known and respected individuals in the profession to start off your 2018 Midwest Clinic day! The inaugural Breakfast with Legends places conference attendees alongside icons of the profession in an engaging and relaxed environment. Don’t miss the opportunity to dialogue, ask questions, hear stories, and more from those that have played a crucial role in the profession’s advancement. A full breakfast buffet will be served. Seating is limited to 100 people. Sign-up is only available through the registration site. If you have already registered for the conference, locate your confirmation email and click on "modify registration". Following a distinguished 33-year teaching career, Paula Crider continues to share her passion for making music as guest conductor, lecturer, clinician and adjudicator in the U.S. and abroad. She is Professor Emerita at The University of Texas, where she was twice awarded for distinguished teaching. Crider has taught in the public schools at all levels, and holds the unique distinction of having been the first female in Texas to serve as director of bands at a class 5-A high school. She presents seminars throughout the U.S. She serves as coordinator for the National Band Association Young Conductor/Mentor Program, is Educational Consultant for Conn-Selmer, and was recently appointed to the Midwest Clinic Board. 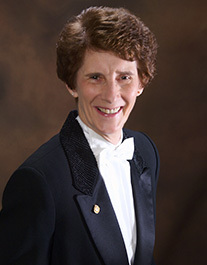 She is a Past President of the National Band Association and American Bandmasters Association. Crider has written numerous articles for The Instrumentalist, The Band Director’s Guide, and National Band Association Journal, and manuals for brass techniques, marching band methods and instrumental conducting. She is co-author for the Masterwork Studies series (Hal Leonard) and author of The Conductor’s Legacy (GIA). Awards and honors include the Tau Beta Sigma/Kappa Kappa Psi “Outstanding Service to Music Award,” Sudler “Legion of Merit,” Women Band Director’s International Rose, Grainger Society Medal, Kappa Kappa Psi Bo Makvosky Memorial Award, National Band Association AWAPA Award, 2004 Texas Bandmaster of the Year, Phi Beta Mu Hall of Fame, and Midwest Medal of Honor. She considers her greatest honor to be the privilege of working with all who share a passion for excellence in making music. Richard Floyd is presently in his 56th year of active involvement as a conductor, music educator and administrator. He has enjoyed a distinguished career at virtually every level of wind band performance from beginning band programs through high school and university wind ensembles as well as adult community bands. Mr. Floyd is a recognized authority on conducting, the art of wind band rehearsing, concert band repertoire, and music advocacy. As such, he has toured extensively throughout the United States, Canada, Australia and Europe as a clinician, adjudicator and conductor including appearances in 44 American states and in 9 other countries. The Austin Symphonic Band, under his leadership, has performed at the Midwest Clinic on three occasions. 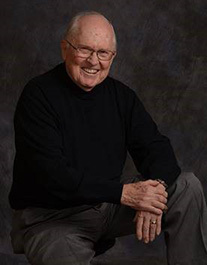 In 2002 he was the recipient of the prestigious A.A. Harding Award presented by the American School Band Directors Association in recognition of his significant and lasting contributions to the school band movement. The Texas Bandmasters Association named him Texas Bandmaster of the Year in 2006 and in 2009 he was presented the Texas Music Educators Association Distinguished Service Award. 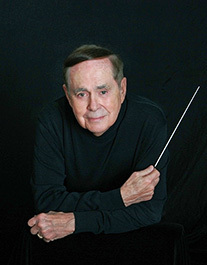 In March of 2011 he was inducted into the Music For All Hall of Fame and awarded the prestigious Midwest International Clinic Medal of Honor for his distinguished and unique contributions to educational bands and orchestras. Most recently he was inducted into the National Band Association Academy of Wind and Percussion Arts, considered to be the Academy Award of wind music performance. He is the author of the critically acclaimed book “The Artistry of Teaching and Making Music” published by GIA Publications. Serving since 1988 on the faculty of The University of Texas at Austin, where he holds the Vincent R. and Jane D. DiNino Chair for the Director of Bands, in addition to serving as a University Distinguished Teaching Professor, Jerry Junkin is recognized as one of the world’s most highly regarded wind conductors. Previously, he served on the faculties of both the University of Michigan and the University of South Florida. In addition to his responsibilities as Professor of Music and Conductor of the Texas Wind Ensemble, he serves as Head of the Conducting Division and teaches courses in conducting and wind band literature. He is a recipient of multiple teaching awards, and students of Mr. Junkin hold major positions throughout the world. He has served as Music Director and Conductor of the Hong Kong Wind Philharmonia since 2003, and as Artistic Director and Conductor of the Dallas Winds since 1993. Additionally, he serves as principal guest conductor of the Sensoku Gakuen College of Music Wind Ensemble in Kawasaki, Japan. In 2005 he was presented the Grainger Medallion by the International Percy Grainger Society in recognition of his championing of Grainger’s works. A recipient of the Kappa Kappa Psi Distinguished Service to music Award, he was the 2012 Texas Bandmaster of the Year and in 2015 received the Medal of Honor from the Midwest International Band and Orchestra Clinic. He is the 2017 Phi Beta Mu International Bandmaster of the Year. Performances under the direction of Mr. Junkin have won the praise of such notable musicians as John Corigliano, David Del Tredici, Gunther Schuller, Karel Husa, William Kraft, Jacob Druckman and Michael Colgrass, among many others. Mr. Junkin has released over 30 compact disc recordings for the Reference, Klavier and Naxos labels. The New York Times named his release with the UT Wind Ensemble on the Reference Recordings label, Bells for Stokowski, one of the best classical CD’s of the year. Their performance of Circus Maximus was recently released on the world’s first Blu Ray audio disc in 5.1 surround sound by Naxos. In 2014 he led The University of Texas Wind Ensemble on a four-week tour around the world. Other major appearances with the UT Wind Ensemble include 1992 and 2008 European Tours, the 2007 Festival Del Sole in Napa Valley, in addition to two Carnegie Hall performances, seven TMEA Convention concerts, three ABA Convention performances and six CBDNA National Convention appearances. Jerry Junkin is an enthusiastic advocate of public school music education, having conducted All-State bands and festivals in forty-eight states and on five continents. He spends his summers in residence at the Interlochen Arts Camp in Michigan, as well as appearing at major music festivals throughout the world. Mr. Junkin has served as President of the Big XII Band Director's Association and is a member of the Board of Directors of The John Philip Sousa Foundation, is Past-President of the American Bandmasters Association, and Past-President of the College Band Directors National Association. Regularly making guest appearances with ensembles such as the Tokyo Kosei Wind Orchestra and the Taipei Symphonic Winds, the current season finds him conducting throughout the United States in addition to appearances in Japan, China, and Europe. Jerry Junkin is a Yamaha Master Educator. Larry Livingston is a distinguished conductor, educator, and administrator, and a highly respected motivational speaker. The founding Music Director of the Illinois Chamber Orchestra, Livingston has appeared with the Houston Symphony and in the Los Angeles Philharmonic Green Umbrella Series. He has conducted at the Festival de Musique in Evian, France, and has led the Stockholm Wind Orchestra, as well as the Leopoldinum Chamber, Chopin Academy, and Wroclaw Philharmonic Orchestras in Poland. He served as Music Director of the Pan Pacific Festival Orchestras in Sydney, participated in the International Jazz Festival in Rome, and conducted electro-acoustic ensemble concerts in Tokyo under the auspices of Yamaha International. Mr. Livingston has led the Houston Symphony, the Los Angeles Philharmonic Green Umbrellas Series, the American Youth Symphony Orchestra, the Young Musicians Foundation Orchestra, the USC Thornton Chamber and Symphony Orchestras in Los Angeles, the USC Thornton Contemporary Music Ensemble in Berlin, and served on the jury for the renowned Besancon International Conducting Competition in Besancon, France. Mr. Livingston has performed with soloists Keiko Abe, Ran Blake, Shelly Berg, Maureen Forrester, Adolph Herseth, Lawrence Lesser, Yehudi Menuhin, Robert Merrill, Mark O’Connor, Christopher O’Riley, Itzhak Perlman, Donald Sinta, Ralph Kirshbaum, Nadja Salerno-Sonnenberg, John Walz and Time for Three, and has premiered and/or recorded works by Shelton Berg, Paul Cooper, Mario Davidovsky, Robert Erickson, Ernst Krenek, Kasia Livingston, Edwin London, Pauline Oliveros, Russell Peck, Roger Reynolds, and Yuji Takahashi. Mr. Livingston frequently appears with professional, festival, collegiate, and all-state wind ensembles, bands and orchestras throughout the United States, Europe, Australia, and New Zealand. From 1983 to 2002, he served as a conductor in the University of Michigan All-State Program at Interlochen, has been the Conductor of the Festival Orchestra at Idyllwild Arts since 1989, and is the Music Director of Music for All’s National Honors Orchestra. .
Mr. Livingston has appeared with the famed Landes Jugend Orchester, served as clinician and guest conductor at the College Band Directors National Conference in Alice Tully Hall, and led All-State Ensembles across the United States including Texas on eleven occasions, an unprecedented record. He has also twice conducted the George Enescu Bucharest Philharmonic Orchestra in Romania, served as Music Director of Thornton School Orchestras, and was Principal Juror for the 3rd Annual Winnipeg Symphony International Conducting Symposium. In 2013-18, Maestro Livingston conducts the All-State Bands or Orchestras of Arizona, Kentucky, California, Colorado, Florida, Massachusetts, Tennessee, Illinois, Iowa, Missouri, New Mexico, Washington, Michigan, and Texas, lead the Sewanee Music Festival Orchestra, serve again as clinician for the Disney Honors Program, and return to Katowice, Poland to conduct the opening concert in an international festival of academy orchestras. As well, he will teach in the conducting workshops of the University of Texas, Austin, the University of Texas, San Antonio, and the University of Colorado. A graduate of the University of Michigan, Mr. Livingston studied conducting with Laurence Livingston, Elizabeth Green, William Revelli, Rafael Druian, and Herbert Zipper. He also did doctoral studies at the University of California, San Diego. Mr. Livingston served as Vice President and Music Director of the New England Conservatory of Music in Boston, where he was also Conductor of the Symphony Orchestra and, subsequently, became Dean of the Shepherd School of Music and Elma Schneider Professor at Rice University in Houston. 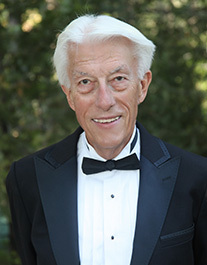 From 1986 until 2002, Mr. Livingston was Dean of the USC Flora L. Thornton School of Music during which time he secured the School’s naming gift from Flora Thornton, raised more than 100 million dollars, and where he is now Chair of the Conducting Department. The first music administrator accepted into the Harvard University Executive Education Program, he is a recipient of the Hall of Fame Award from the University of Michigan, the Life in the Arts Award from Idyllwild Arts, and an Outstanding Teacher Award from the USC Center for Religion. As a motivational speaker, he has established a national reputation for inspiring presentations to business and education leaders across the United States. From 2008 to 2015, Mr. Livingston was Director of Educational Initiatives for the Guitar Center where he created and led the national educational quest, ALL IN. He is a consultant to the Conn-Selmer Corporation and, at the request of Quincy Jones, Mr. Livingston chairs the Education Committee of the Quincy Jones Musiq Consortium. 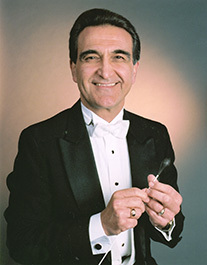 Anthony J. Maiello, Artistic Director and Conductor, American Festival Pops Orchestra, Washington, D.C., makes professional appearances both nationally and abroad conducting music festivals, adjudicating ensembles and presenting clinics, lectures and workshops throughout the United States, Canada, Mexico, the Bahamas, England, The Netherlands and Europe. In addition, he as been invited to conduct bands and orchestras in China, Singapore, Japan, South Korea and Australia. He conducted musical activities for the Gold Medal Ceremonies at the 1980 Winter Olympics in Lake Placid, New York; served as Musical Director for Music Festivals International; was selected as President of International Association of Jazz Educators – New York State Chapter; and is a guest clinician for Yamaha Corporation, G.I. A. publications and Belwin/Warner Bros. Publications. In 2010, he was inducted into the Bands of America Hall of Fame at Music for All's Indianapolis headquarters. In 2015 he received the Phi Beta Mu International Band Fraternity “Band Conductor of the Year” Award. This is his 54th year of teaching. Freddy Martin was born and educated through high school in Cobb County, Georgia. Mr. Martin attended Jacksonville State University in Alabama where he received the Bachelor of Science degree in Music Education. Mr. Martin has done post-graduate work at Georgia State University in Atlanta. Mr. Martin is celebrating his 48th year in education. Mr. Martin has taught at South Cobb High School in Cobb County Georgia, with the Spirit of Atlanta Drum Corps, for the Buford City Schools in Buford Georgia, and presently at the Westminster Schools in Atlanta. Mr. Martin is the founding director of the Spirit of Atlanta Drum and Bugle Corps and continues to serve the Corps today as director emeritus. Mr. Martin was the Brass Coordinator for the DCI Champion Phantom Regiment Drum Corps from Rockford Illinois. Since 2014 Mr. Martin has been pedagogy co-ordinator for the Cavaliers Drum Corps from Rosemont Illinois. Mr. Martin is a member of the Drum Corps International Hall of Fame and Phi Beta Mu professional music fraternity. He is in his eighteenth year as band director and brass specialist at The Westminster Schools. Mr. Martin’s son Chris is Principal Trumpet in the New York Philharmonic. His son Michael is third utility trumpet in the Boston Symphony Orchestra. Mr. Martin has been an adjudicator and clinician for more than forty years. Mr. Martin holds an honorary Doctorate in Music Education from The Vandercook College of Music in Chicago. Mary Jo Papich, known for her avid support and leadership in arts education, is Co-Founder and first president of the Jazz Education Network (June 1, 2008). JEN is now in all states and 22 countries! She is the founder/artistic director for Jazz Fests for school bands in New Orleans and Puerto Vallarta. Serving public school education for 35+ years, she recently retired as Fine Arts Director for Skokie D219-recognized as one of the finest HS Fine Arts program in the nation; she served 8 years as Fine and Applied Arts Chair at Highland Park High School and coordinated FOCUS ON THE ARTS festival with hundreds of volunteers. While the district Fine Arts Coordinator of 35 schools in the Peoria Public School System #150 (’92-’01), she founded and directed the Peoria Jazz All Stars whose performances included Montreux, North Sea, and Umbria Jazz Festivals, IMEA Conference, American School Board Association Conference and many other state and local events. In her retirement Papich is once again directing the AllStars, the group has been in existence 25 years spawning careers of many young musicians, many are professional performers and educators today with several earning Grammy nominations and an Academy Award. Prior to her administrative position, Mary Jo was an award winning band director at Peoria’s Woodruff High School (‘82-’92). Before leaving Peoria in 2001, she founded a District Preparatory Arts School at Peoria High School. Her early years of teaching were in rural Iowa, Ottumwa and Moulton-Udell K-12 public schools. Her leadership/honor positions in addition to JEN include: Founder of the Puerto Vallarta Jazz Festival via HP Sister Cities Foundation, serving on the Artistic Access to Excellence Panel for the National Endowment for the Arts and as a member of the Quincy Jones Consortium, Chicago Jazz Philharmonic Advisory Board, International Association of Jazz Education Board of Directors/President Elect, past Illinois Music Educators Association Vice-President, and Highland Park Cultural Arts Commission, Highland Park Public Art Committee, and many other arts organizations. MJ currently serves on the selection committee for the NARAS Grammy Music Educator of the Year award. 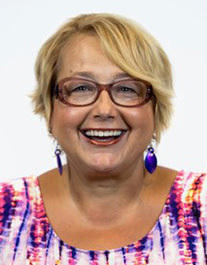 Mary Jo’s recent honors include receiving a Lifetime Jazz Education Achievement Award from DownBeat magazine, the Arts Inspiration Award from The Art Center, Superintendent’s Recognition Award, Character Counts Award, Huespid Distinguido from the Mayor in Puerto Vallarta and the Prestigious Women in Jazz Award from the Chicago Jazz Ensemble. Former awards include: Peoria Public School Superintendent's Award, and YWCA Leader in the Arts Award. HPHS Patrons of the Arts annually award a Highland Park High School student the M.J. Papich Leadership Scholarship. JEN has honored her with giving the Mary Jo Papich Women In Jazz Scholarship to deserving students at their annual conference. In 2015, Tau Beta Sigma music sorority presented her with the Outstanding Service to Music Education award. Most recently, she was presented with the Outstanding Jazz Educator of the Year award from the Chicago Jazz Institute in April 2018. Mary Jo was youngest of seven children and her father died when she was one year old so a hardworking mother and loving brothers and sisters raised her. She was the first person in he family to graduate from college. She is a graduate of Truman State (MO) and Bradley University (IL) was raised in south central Iowa; graduating from Albia (IA) Community High School, where she was inducted in to the Hall of Fame. Her many presentations include: National Association for Music Education National Conference, many State MEA conferences, The Midwest Clinic, IAJE Conferences, Siena Jazz Foundation (Italy), South African Jazz Conference (2008/2010) at the University of Cape Town, Brubeck Institute. Her professional affiliations include IMEA, NAfME/MENC, ASCD, Illinois Arts in Education Alliance, International Women in Jazz, National Association of Professional Women and International Society for Music Education. Papich's vision is that all children will know and appreciate the arts, especially their musical heritage of jazz. H. Robert Reynolds is the Principal Conductor of the Wind Ensemble at the Thornton School of Music at the University of Southern California where he holds the H. Robert Reynolds Professorship in Wind Conducting. This appointment followed his retirement, after 26 years, from the School of Music of the University of Michigan where he served as the Henry F. Thurnau Professor of Music, Director of University Bands and Director of the Division of Instrumental Studies. In addition to these responsibilities, he has also been, for over 35 years, the conductor and Music Advisor of The Detroit Chamber Winds and Strings, which is made up primarily of members from the Detroit Symphony. Robert Reynolds has conducted recordings for Koch International, Pro Arte, Caprice, and Deutsche Grammophon. In the United States, he has conducted at Carnegie Hall and Lincoln Center (New York), Orchestra Hall (Chicago), Kennedy Center (Washington, D. C.), Powell Symphony Hall (St. Louis), Academy of Music (Philadelphia), and Disney Concert Hall (Los Angeles). 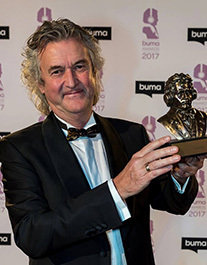 In Europe, he conducted the premiere of an opera for La Scala Opera (Milan, Italy), and concerts at the prestigious Maggio Musicale (Florence, Italy), the Tonhalle (Zurich, Switzerland), the Lucerne Festival Hall (Lucerne, Switzerland), and at the Holland Festival in the Concertgebouw (Amsterdam, Holland), as well as the 750th Anniversary of the City of Berlin. He has won the praise of composers: William Bolcom, Aaron Copland, John Corigliano, Henryk Gorecki, Karel Husa, Gyorgy Ligeti, Darius Milhaud, Bernard Rands, Gunther Schuller, Karlheinz Stockhausen, and many others for his interpretive conducting of their compositions. Robert Reynolds has been awarded an Honorary Doctorate from Duquesne University, and in addition, holds degrees in Music Education and Performance from the University of Michigan where he was the conducting student of Elizabeth Green. He began his career in the public schools of Michigan and California before beginning his university conducting at California State University at Long Beach and the University of Wisconsin prior to his tenure at the University of Michigan. He received the Citation of Merit from the Music Alumni Association of the University of Michigan for his contributions to the many students he has influenced during his career and the Lifetime Achievement Award from the Michigan Band Alumni Association. He is also an Honorary Life Member of the Southern California School Band & Orchestra Association. Professor Reynolds received the very first “Lifetime Achievement Award” and is a Past President of the College Band Directors' National Association and was also Past President of the Big Ten Band Directors' Association. He has received the highest national awards from Phi Mu Alpha, Kappa Kappa Psi, Phi Beta Mu, the National Band Association, and the American School Band Directors’ Association, and he was awarded the “Medal of Honor” by the International Mid-West Band and Orchestra Clinic and December 2018 will begin the “Mid-West Reynolds Conducting Institute”. He is the recipient of a “Special Tribute” from the State of Michigan, and he served for many years on the National Awards Panel for the American Society of Composers, Authors and Publishers (ASCAP) and in 2001 received a national award from this organization for his contributions to contemporary American music. He is also listed in the New Groves Dictionary of American Music, and his frequent conducting appearances have included (among others) the Eastman School of Music, New England Conservatory, Oberlin Conservatory, Northwestern University, Manhattan School of Music, the Tanglewood Institute, and the Detroit Symphony Orchestra. Robert Reynolds has been a featured conductor and lecturer at international conferences in Austria, Norway, Belgium, England, Holland, Slovenia, Germany, Denmark, and Switzerland. He has conducted in many of the major cities of Japan, Australia, and Sweden including concerts with the Stockholm Wind Orchestra, the Norrkoping Symphony Orchestra and professional wind ensembles in Bilbao and Barcelona, Spain. Many of his former students now hold major conducting positions at leading conservatories and universities, and several have been National Presidents of CBDNA. 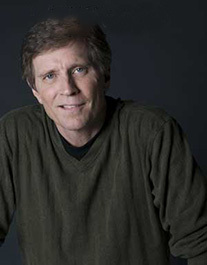 Frank Ticheli's music has been described as being "optimistic and thoughtful" (Los Angeles Times), "lean and muscular" (New York Times), "brilliantly effective" (Miami Herald) and "powerful, deeply felt crafted with impressive flair and an ear for striking instrumental colors" (South Florida Sun-Sentinel). Ticheli (b. 1958) joined the faculty of the University of Southern California's Thornton School of Music in 1991, where he is Professor of Composition. From 1991 to 1998, Ticheli was Composer in Residence of the Pacific Symphony. His orchestral works have received considerable recognition in the U.S. and Europe. Orchestral performances have come from the Philadelphia Orchestra, Atlanta Symphony, Detroit Symphony, Dallas Symphony, American Composers Orchestra, the radio orchestras of Stuttgart, Frankfurt, Saarbruecken, and Austria, and many others. Ticheli is the recipient of a 2012 "Arts and Letters Award" from the American Academy of Arts and Letters, his third award from that prestigious organization. His Symphony No. 2 was named winner of the 2006 NBA/William D. Revelli Memorial Band Composition Contest. Other awards include the Walter Beeler Memorial Prize and First Prize awards in the Texas Sesquicentennial Orchestral Composition Competition, Britten-on-the-Bay Choral Composition Contest, and Virginia CBDNA Symposium for New Band Music. 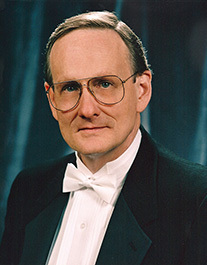 He was awarded national honorary membership to Phi Mu Alpha Sinfonia, "bestowed to individuals who have significantly contributed to the cause of music in America," and the A. Austin Harding Award by the American School Band Directors Association, "given to individuals who have made exceptional contributions to the school band movement in America." Alfred L. Watkins, Co-Founder, Musical Director and Conductor of the Cobb Wind Symphony, recently concluded his 37-year career as a high school band director. He was Director of Bands at Lassiter High School in Marietta, Georgia for 31 years. For six years prior to joining Lassiter, Watkins served as Director of Bands at Murphy High School in the Atlanta Public Schools. Mr. Watkins is a 1976 graduate of Florida A & M University. Bands under Watkins’ direction have performed five times at the Midwest Band Clinic, six performances at the MFA National Concert Band Festival and four performances at the GMEA In-Service Conference. The symphonic band has performed on seven college campuses and the Lassiter Percussion Ensemble has performed twice at the Midwest Clinic, PASIC, three times at the National Percussion Festival and four times at the GMEA In-Service Conference. The Lassiter Marching Band was the 1998 and 2002 Bands of America Grand National Champion and the band also won nine BOA Regional Championships. Under Watkins’ leadership, the band also participated in four Pasadena Tournament of Roses Parades (spanning 25 years), three times in the Macy*s Thanksgiving Day Parade (NYC), twice in the King Orange Bowl Parade (FL) and once in the Florida Citrus Bowl Parade. During Mr. Watkins’ Lassiter tenure, all four (or five) Lassiter concert bands received consecutive Superior Ratings from 1993 until his retirement in 2013, with the top two bands earning consistent superior ratings in Grade VI for his last 24 years. The band program is one of few bands in America to have received both the Sudler Flag of Honor for outstanding concert bands and the Sudler Shield for outstanding marching band. The Lassiter Winter Color Guard was named Winter Guard International World Champions in Scholastic “A” and “Open Class” in 1996 and 1997. For well over 35 years, Watkins has been a judge for marching, concert bands and lecturer throughout the country. He has also had the pleasure of conducting All-State High School Bands in 18 states and has worked with bands from 35 states. 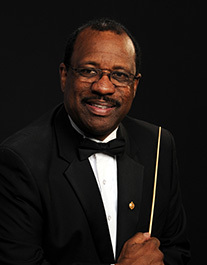 Mr. Watkins has been selected as a member of the American Bandmasters Association, the Florida A & M University Gallery of Distinguished Alumni, the Georgia Chapter of the Phi Beta Mu Hall of Fame and the Bands of America Hall of Fame. In 2014, Watkins received the Edwin Franko Goldman Award from ASBDA and in December 2017, he was a recipient with the Midwest Clinic Medal of Honor. In 2018, Mr. Watkins was the recipient of the Kappa Kappa Psi Honorary Band Fraternity’s prestigious Distinguished Service to Music Medal. He has received 20 Certificates of Excellence from the National Band Association, the Sudler Order of Merit from the John Philip Sousa Foundation and the Band World Magazine Legion of Honor. Mr. Watkins is Co-Founder, Conductor and Musical Director of the Cobb Wind Symphony, an all-adult community band based in the Atlanta area, which has earned the Sudler Silver Scroll Award, performed three times at the Southern Division of CBDNA and has performed three times at the Midwest Clinic. At present, Watkins is one of the few conductors to hold three Sudler Awards (Flag, Shield, Silver Scroll) simultaneously. In 2009 and 2010, two doctoral dissertations were written centered around his life and work with the Lassiter Band Program. The $1.5 million Alfred L. Watkins Band Building at Lassiter High School bears his name. Currently, Mr. Watkins is a Co-Founder and President of the Minority Band Director National Association, Inc. and is an Educational Clinician for the Conn Selmer Corporation, Division of Education. He and his wife for 35 years, Rita, live in Marietta. They have two adult sons: Christopher, a trumpeter in the United States Army Band “Pershing’s Own” in Washington, D.C. and Jonathan, a businessman in San Diego, CA. 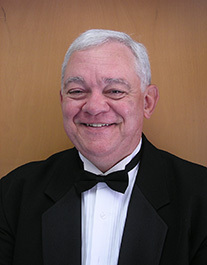 John L. Whitwell is Director of Bands Emeritus at Michigan State University, where he served as Director of Bands, Conductor of the Wind Symphony, Professor of Music, Chair of the Conducting area, and guided the graduate degree programs in Wind Conducting prior to his retirement in 2006. Prior to his appointment at Michigan State University, Professor Whitwell held positions at Stephen F. Austin State University and Abilene Christian University. He also taught in the public schools of Michigan as band director at Ann Arbor Huron and Northwest Jackson high schools. His bands have performed for the College Band Directors National Association Convention, Texas Music Educators Association Clinic-Convention, Midwest Clinic, and Midwestern Conference on Vocal and Instrumental Music. He is an emeritus member of the Board of Directors of the Midwest Clinic, past-president of the Big Ten Band Directors Association, and past-president of the North Central Division of the College Band Directors National Association. 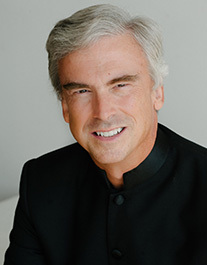 Professor Whitwell maintains an active schedule and is in great demand as a guest conductor and clinician throughout the United States, Canada, Mexico, and abroad. He is extremely active in the commissioning of new music and has participated in commissioning projects with composers Samuel Adler, Fred Allen, Kenneth Amis, William Averitt, Steve Barton, Susan Botti, Timothy Broege, Daryl Burghardt, Michael Colgrass, Donald Crockett, James Curnow, Richard Danielpour, Michael Daugherty, Eric Ewazen, Michael Finnissy, Michael Gandolfi, David Gillingham, Daniel Godfrey, Michael Golemo, Adam Gorb, Donald Grantham, Murray Gross, Daron Aric Hagen, Sam Hazo, David Heckendorn, Jennifer Higdon, Sydney Hodkinson, Jere Hutcheson, Robert Jager, Ian Krouse, Timothy Mahr, John Mackey, Daniel McCarthy, David Maslanka, Gregory Mertl, Cindy McTee, John Moss, Lior Navok, Ron Newman, James Niblock, Robert Xavier Rodriguez, Charles Ruggiero, Joseph Spaniola, Eric Stokes, James Syler, Frank Ticheli, Joan Tower, Joseph Turrin, Michael Weinstein, Eric Whitacre, Dana Wilson, and Charles Rochester Young.